Floor drain backs up when doing laundry. Front-load washing machine has water around it when wash cycle finishes. Either the washer has a leak or the floor drain is blocked. We checked the washing machine hoses and water lines and have not found a leak. I placed a garden hose into the floor drain and the water seems to drain with no issues. Even though the garden hose water goes down the floor drain, it still seems that the floor drain backs up when doing laundry and causing the water to overflow. What are some washing machine drain overflow solutions? Washer Leaking Or Floor Drain Is Blocked? Your washing machine drains with positive pressure from the pump. If the washing machine pumps the water out faster than the blocked floor drain can handle, it will back up and cause flooding. Most likely a blockage or a partial blockage in the pipe is causing the issue. QUICK CHECK: Inspect all hoses and lines on the washer for leaks, watch the floor drain when the washer discharges the water, determine what is causing the water leak/flood, use the steps below to remove the blockage in the floor drain or fix the water leak on the washer. DID YOU USE A GARDEN HOSE? : The garden hose test on a suspected blocked floor drain may not be the best method. A washing machine pumps the water out at around 17.5 GPM gallons per minute. This is 2 or 3 times the force of a normal garden hose flow. If you suspect the washing machine floor drain to be clogged and use a garden hose to determine this, usually the water from the hose will flow into the floor drain with no problem causing you to think the drain is not clogged. IS THE DRAIN CLOGGED? : The best way to determine if the floor drain is blocked is to check the floor drain/drain pipe when the washer is pumping out or discharging the water. If the water overflows, you will know there is a blockage or partial blockage. This also applies if the washing machine drain overflows by the wall where the discharge hose goes into or if you notice the standpipe overflowing. DO YOU HAVE A VENTING ISSUE? : Depending on the layout of your home, there may be a “venting” problem causing the drain issue. What happens with a venting issue? The washer will drain into the floor drain and flooding occurs even if the drain is clear. Check the vent pipe on the roof (if applicable) as it may be blocked and causing the issue of NO DRAIN. Many times the floor drain will not be clogged but the water will overflow. This causes you to think the floor drain is blocked but in reality the vent pipe on the roof or other vent is blocked and causes this issue. Is The Water Leaking From The Washing Machine? Check all these reasons why water may be leaking around your washing machine TO RULE OUT THE WASHER. This should be checked if you are unsure if the drain is the issue or if the washer is leaking the water. Inspect the water hoses from wall to washer. Check the drain line to be sure it is secure and in place. Check all the water hoses and drain lines for damage. NOTE: If the washer drain pump does not work properly, the washer will not drain, even if the drain line is not obstructed. Check that the drain pump is in working order. If the washing machine checks okay and no leaks, you will have to determine if the floor drain is blocked or partially blocked. The washer drains with positive pressure. The pressurized water goes into the open top tube down into the sewer. When the washing machine pumps the water quicker than the floor drain can handle, it will back up and flood. There is an obstruction or blockage in the pipe and this is causing the flooding. THE DRAIN IS BLOCKED: If you find the floor drain to have a blockage, you can attempt to remove the clog with a snake, auger, or a chemical drain cleaner. If you determine the floor drain blockage is not a DIY job, we recommend using a professional plumber to come out and clean the drain. HINT: If there is a sink in the room, see how the drain line empties by filling the sink with water. If it drains fast and then goes slow, you most likely have a partial obstruction, restriction, or a clog that is further down the drain line. You can attempt to use some Drano or Liquid Plumber or similar. Pour it down the drain or the open top tube and let sit for about 3 to 5 hours. This will hopefully dissolve any clogs that you have in the line. Use a second time if not successful the first time. Another option you can try is using a industrial plunger or snake to attempt to open it up further. Read the instructions on how to use your drain snake. A snake is what professional plumbers use and will most likely unclog the drain if used properly. Is The Snake The Correct Size? : Make sure the snake you use is LONG ENOUGH, use it in the CORRECT LOCATION, and make sure it is BIG ENOUGH. Be sure the snake that is used is not too short to unclog the line. The snake needs to be fed down into the exact location where the blockage is. Go far enough, in the right area, and be sure the snake is the correct size for the job. If all else fails we recommend calling a pro. The professional plumbers have all the right equipment and know how to resolve the problem. If a main line is the problem, this affects all drains in your home. New Washer Or New Drain Pump? : If you replaced the drain pump on your washer or got a brand new washer, that may be the problem. 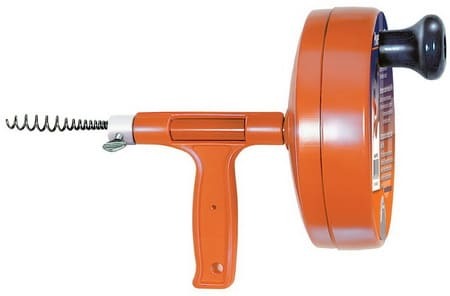 A new drain pump might be extra powerful for a 2 inch pipe to drain the water. A clogged pipe could push water back through your hose thus causing the drain pump to work harder and soon fail and need to be replaced. 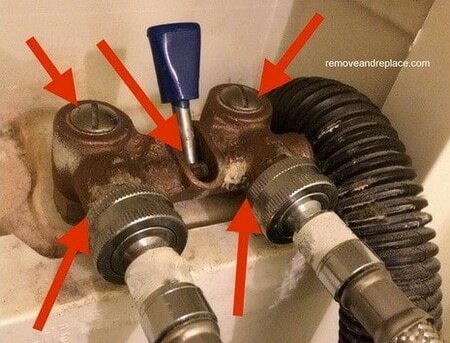 How to replace a washing machine drain pump. If you have a clogged drain line and need help with unblocking it or other questions about your washing machine leaking water, please leave your question and or comments below and we can assist.